Hello fellow readers, I am Zheng Yang and I am a new co-author of Le Vanguard. Hope my posts will help you guys understand more about vanguard. Today, I will be assessing a card that we are very familiar. DAUNTLESS DRIVE DRAGON, also known as DDD. For the convenience of those who do not know what its effect is, here. This card have its strong points and weak points. -The 10k power it gives its vanguard. -The fact that you are able to stand again to attack with massive attack power. -The 11k base which makes you almost immune to those pesky 12k attckers with 8k boosters. -Its a limit break(4) card, you will need 4 damage to activate the breakride. [CONT](VC/RC):If you have a non-«Kagero» vanguard or rear-guard, this unit gets [Power]-2000. 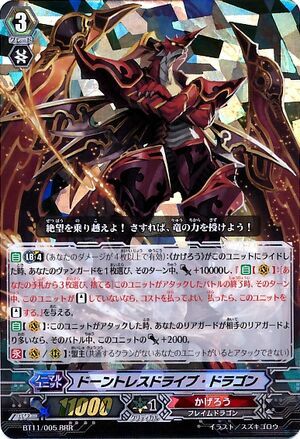 [CONT](VC):If you have a card named "Dragonic Overlord" in your soul, this unit gets [Power]+2000. 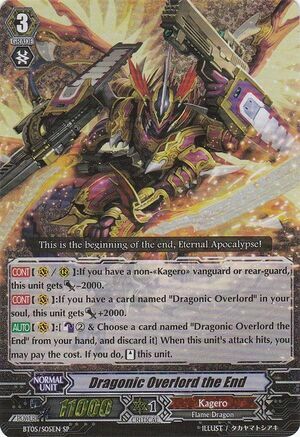 [AUTO] (VC):[Counter Blast (2) &Choose a card named "Dragonic Overlord the End" from your hand, and discard it] When this unit's attack hits, you may pay the cost. If you do, [Stand] this unit. So should i not use DOTE with DDD? It is still usable, however if my first attck hit, i would use DOTE effect first to get the +1(cards gained that turn. However, you may take the risk and use DDD's skill first, however, i suggest only do this on your FINAL TURN. What other cards can I play with DDD? [CONT](VC):If you have a card named "Amber Dragon, Dusk" in your soul, this unit gets [Power]+1000. [ACT](VC):[Counter Blast (2)] This unit gets "[AUTO](VC):When this unit's attack hits a vanguard, choose up to two of your opponent's rear-guards, and retire them." until end of turn. This adds TONS of pressure on your vanguard circle as your opponent risks two units being retired and yes, this skill only needs to be activated once per turn and it will still have the skill when he restands with DDD's ability. However the downfall of this card is that if I do not have the g2 version of amber dragon in soul, eclipse will be a weak 10k vanguard. Other cards that can be used with DDD are endless and it all boils down to personal preference. Why put (if this unit did not [Stand] during this turn, you may pay the cost. If you do, [Stand] this unit." until end of turn.) at the last minute? Well, simply put, it combos too well with dote and to prevent overuse of DOTE, this ability was added to DDD. Trust me, if this part was not part of the awesome skill of DDD, it will be overused and thus will lead to restirction of dote yet again, fellow DOTE fans, take this part of the ability as a price to pay to free DOTE. From the chains of restriction! I have a DOTE deck but have budget issues, what can I do? Easy, i reccomend this g3 lineup, 2 Dantless Drive Dragon, 2 Dragonic overloard, 4 DOTE. Why? you may ask, if u manage to ride either DO or DDD, it will give you a huge advantage over tour opponent. IF DOTE over DO, CROSSRIDE! 13k base. If DDD then you get the awesome breakride ability. Overall, if on the scale of 1-10, I give DDD 8/10. Its has an awesome ability but it restricts DOTE and plus, its a LIMIT BREAK(4) card, so you may not use his effect till the fourth damage, which skilled players will know how to deal with that. Well thats all I have to say about DDD. Please provide feedback about my views about DDD or even better, do enlighten me more about DDD if i have to stated in any of my points above. Thanks for your time!